Best Chinese Knives: Sanrenmu 7130 EDC Fixed Blade - ESEE Izula Killer? Sanrenmu 7130 EDC Fixed Blade - ESEE Izula Killer? Today we will have a review of one of my favorite knives of recent time - the Sanrenmu 7130. Sorry for the delay in the reviews - have been caught up with everyday life. And as always - knives I like the most take me the longest period of time to review (got this knife a few months ago). - The Sanrenmu 7130 comes in a branded cardboard presentation box (really worth mentioning this packaging - could suit for a gift). Quality out of the box is excellent - no issues at all - it came sharp, symmetrical bevels, no fit and finish issues and had great retention in the sheath. - The sheath. Has great retention, gimping in the right places and a great rotatable clip. The same clip could be seen on the more expensive RUIKE fixed blades. Much better than a Tek Lock for EDC IMO. - 8Cr14MoV Steel - Not the most impressive steel out there, but could be easily sharpened and Sanrenmu really know how to heat treat it well (so take this steel to the max). I am pleased with the edge retention and from the corrosion resistance. - The design. From the first glance it does remind the Izula a lot, but has a different shape of the handle, the cutouts and the sheath, so although sharing similar concept - isn't a clone IMO. - Great quality, fit and finish out of the box and in general. - Awesome packaging. Comes with a neck chain as well. - Price and incredible value. - No gimping on the spine of the blade. Will add it myself or glue a piece of skateboard tape. - Sanrenmu doesn't make G10/Micarta scales for it and I really think they should. Could make it even better. Meanwhile I wrapped it with paracord to provide a better grip (works really well). 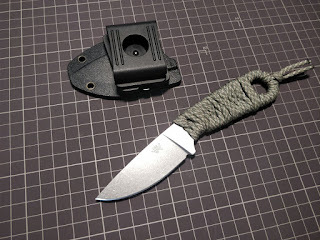 - The clip on the sheath is excellent, but makes the whole construction pretty thick. 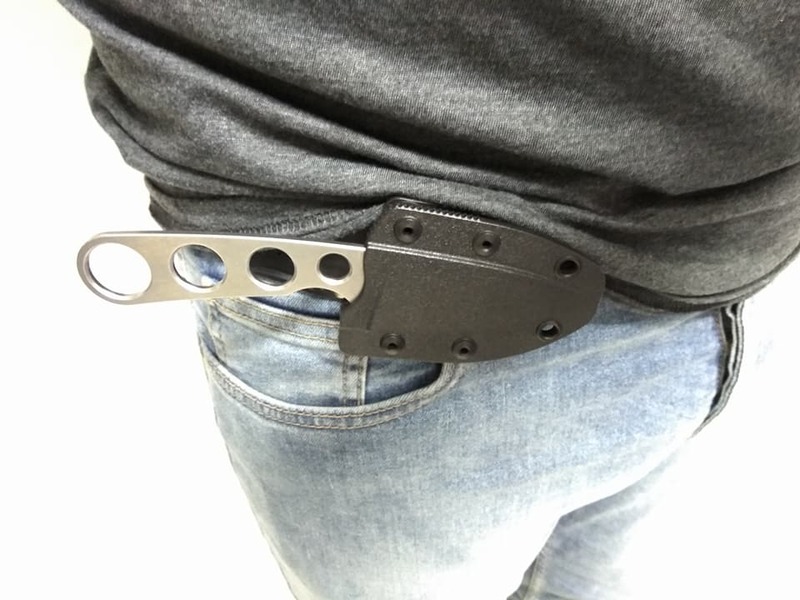 - Overall this is an excellent option for a small budget EDC fixed blade (but could also be used in the outdoors). The build quality and the concept give it a great value and you couldn't be wrong with one IMO. Could also fit folks that wanted to try the Izula but passed due to the relatively high price.